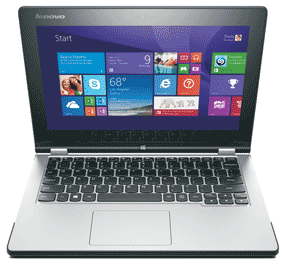 Lenovo Yoga 2 11.6" Touchscreen Laptop Pentium Quad Core 4GB 500 GB + 8GB SSD. The Lenovo Yoga 2 11 is a multi-mode mini laptop with an 11.6" (294.64mm) HD IPS touchscreen that can fold back 360o, providing the ultimate flexibility between work and play. It features unique app recommendations for each of the 4 usage modes -- Laptop, Stand, Tent and Tablet. 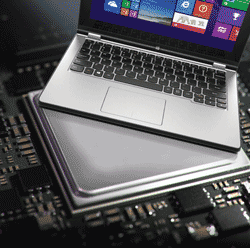 Plus, the Lenovo Yoga 2 11 also houses the industrys first Quad Core Pentium Processor for a blazing performance. The Lenovo Yoga 2 11 is for those who want their laptop to adapt to the way they use their device, for example, Laptop mode for focused tasks, Tablet for lighter, social browsing. Its 4 modes quickly allow the Yoga 2 to adapt to any situation. This mode is unique to Lenovo and is ideal for utilising the intuitive 10-point touchscreen and using the Chef app. 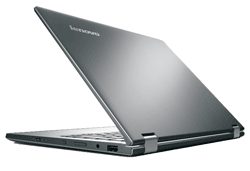 Be as productive as possible when working, by placing your Lenovo Yoga 2 11 into Laptop mode. The Phone Companion app is ideal for this mode. View images to share on social media using the Camera Man app. 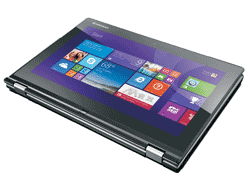 Fold your Lenovo Yoga 2 11 back to place in stand mode. Enhance your favourite pictures with the Photo Touch app. Place your Lenovo Yoga 2 11 in Tablet mode to ensure entertainment on the go. The 11 HD display can make you see the screen clearly from almost any angle with IPS wide-view technology. Enjoy greater accuracy with the 10-point multi-touch display, which is optimised to work with Microsoft Windows 8.1. Easily share files, photos, videos and more with tablet-style display with easy scroll and zoom functions. This innovative screen is sensitive and easy to use, making typing easier and offering a responsive gaming experience. The finger-friendly curved and back-lit key shape and ergonomic spacebar of the AccuType keyboard will work together to make it easier to type and reduce the number of typos, wherever you find yourself working. Packed with the industrys first Quad Core Intel Pentium processor and preloaded with Microsoft Windows 8.1, run all your apps with seamless multitasking. 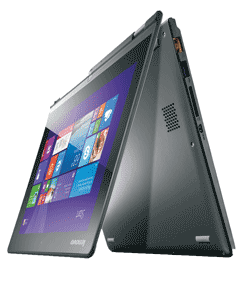 The Lenovo Yoga 2 11 weighs 1.45 kg (3.196lbs) and is only 11.7mm at its thickest. The size, combined with the convenient Tablet mode makes the laptop very portable. Listening to music, films and games on your Lenovo Yoga 2 11 will never be the same. With the Dolby Home Theater tools, you can experience riveting surround sound on your laptop PC. Dolby Home Theater technology enables the Lenovo Flex to deliver a crisp, clear cinematic surround sound experience over its built-in speakers. It also adds clarity to sound from headphones. You can also enjoy your multimedia on the big screen by using the built-in Micro-HDMI out port to hook your laptop up to a HDTV, monitor or projector -- ideal for sharing your favourite videos with friends. 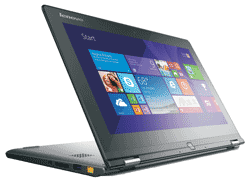 The Lenovo Yoga 2 11 comes with multiple wireless connection options. The built-in 802.11b/g/n Wi-Fi adapter will allow you to enjoy reliable connections to the internet, while Bluetooth 4.0 makes it easier to connect and share files with other devices. You can also connect a compatible USB 3.0 device, such as an external drive, offering transfer rates 10 times faster than a standard USB 2.0. The Lenovo Yoga 2 11 comes equipped with a long-life battery, so you can get the most out of your laptop PC between charges. You will be able to enjoy up to 6 hours* of web browsing or HD playback (150 Nits) before it needs to be topped up. *Battery life is an estimated maximum. Actual battery life may vary based on many factors. Lenovo Cloud -- Imagine your files, everywhere. Lenovo's online storage and cloud utilities allow you the freedom to choose your device and location. With 5GB of free storage, you'll be able to secure and access your files wherever you are, on whatever machine you find yourself on. Exclusive Lenovo Content -- Discover all the amazing things you can do with exclusive tools from Lenovo. Learn how to get the most from your PC with Lenovo Companion or monitor your system performance with Lenovo Support. Lenovo keeps you up to date and delivers music, game and video content you can't get from anyone else. Not Included (Designed To Be Thin & Light) - External Optical Drive Available Seperately.